Soundcatchers Personal Self Powered Monitor Product Description: The Soundcatchers Personal Self Powered Monitor is a very powerful and versatile tool that gives the user many capabilities never before offered in one single device to the live performer. Finally.... the Horn Player can have a tool.. to compete in the modern amplified performing environment. For instance: Loud Drums, Guitar amps, Keyboard arrays. can finally be filtered out of your personal mix as desired at the simple touch of the finger... The Soundcatchers Personal Self Powered Monitor offers five main features combined into a small self contained, convenient device, Up until now most of the individual features were only available from other manufacturers in bulky and singular forms. To achieve similar results, many wires and wall plugs would be required. 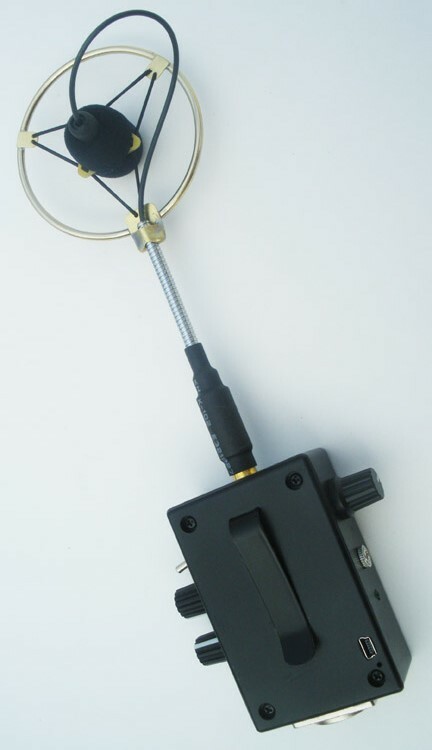 Combined with one of the Soundcatchers Electret Microphones, any of the Horn Mounted Anti-Shock Microphone or the Static Mounted Soundcatchers Electret Microphones. Will give the performer a complete Microphone/Monitor experience never before offered in such a small, lightweight and convenient performing tool. 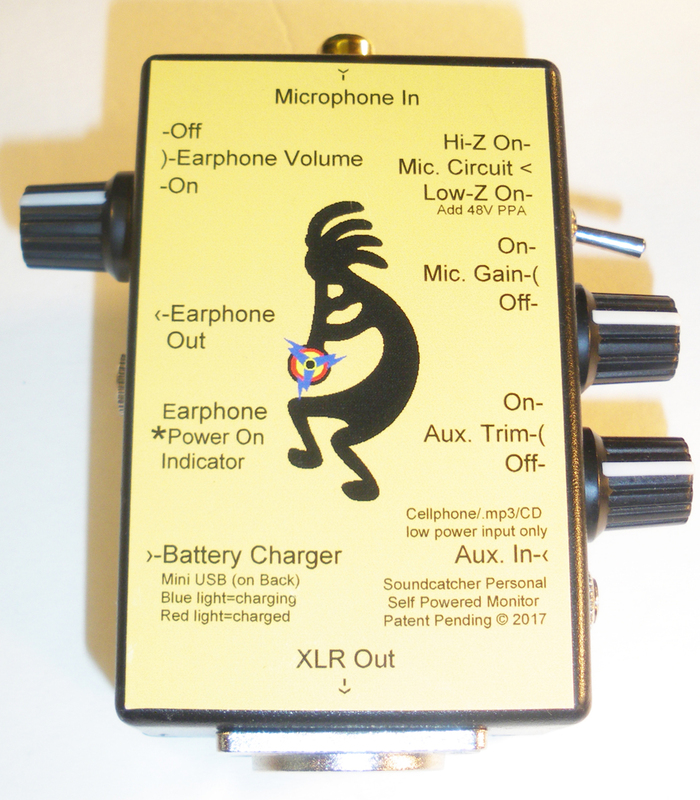 1) First and foremost is the onboard switchable choice of two separate microphone circuits, one is the high sound quality Soueps design circuit this one requires the standard 48V Phantom Power supplied through the XLR output from the amplifier used by the sound system used (figure 1) AND if there is no 48V Phantom Power available the device has the basic Electret microphone circuit with power supplied by the onboard rechargeable battery (figure 1). 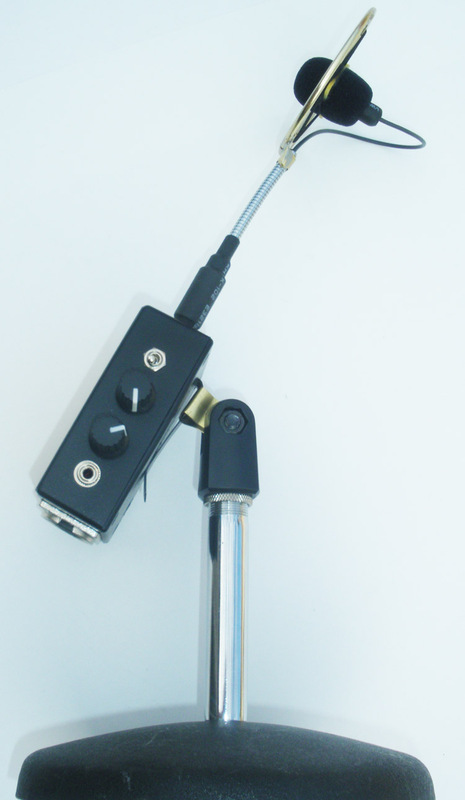 1a) Also there is an Electret Microphone Gain power/volume potentiometer (figure 2). 2) Second is the headphone Mix. plug in your favorite headphones, earbuds or personal speaker of your choice (figure 3). 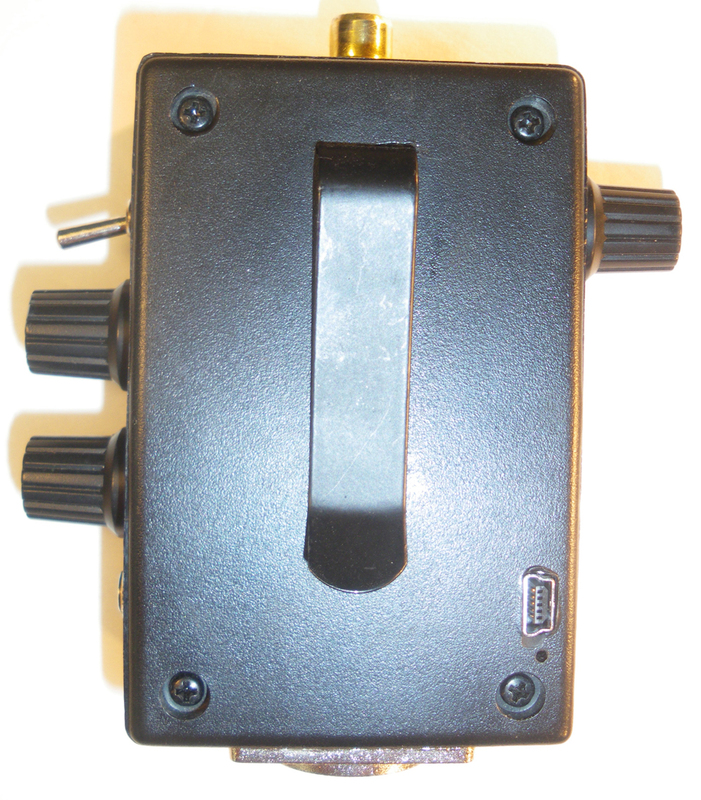 With a power/volume potentiometer at your disposal (figure 4). 3) Third is the Auxiliary input (figure 5) also with its own power/volume potentiometer (figure 6). 4) Fourth is the onboard 3.7V Lithium/Ion battery and MINI USB battery charger circuit, can be plugged into any USB power source (figure 7). 5) Fifth is the versatile mounting hardware. The Soundcatchers Personal Self Powered Monitor has several different ways to be mounted. 1) on your belt. 2) on your music stand. 3) on any standard microphone stand (figure 8). With this complete, small and lightweight, powerful tool. The Performer NOW has the POWER to control his sound with CONTROL and COMFORT. No longer will it be necessary to "blow your horn too hard, and turn red in the face, all night" simply to be heard.... I'm sure many if not all horn players can identify with this problem. I have designed this system for my own professional use, and I am now pleased to offer this device to all.